If you’ve been visiting here for a while, you’ve probably started to recognize the views that I photograph most frequently. 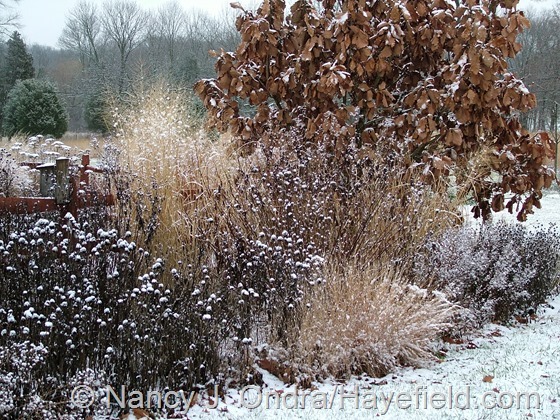 At first, that was coincidence: I was just shooting whatever parts of the garden looked the best to me at the time. Then it was convenience: I’d stand at a point where two or more paths came together and quickly shoot in a variety of different directions. The image below for instance, shows an aerial view of what I think of as the Diagonal Path, with three points I use quite frequently. Three paths join at the green- and blue-starred point, giving me three obvious directions for picture-taking. The red star also marks what’s technically a junction of three paths, but it gives me even more options. Just by turning in a circle, I can get four distinctly different views from this one spot. 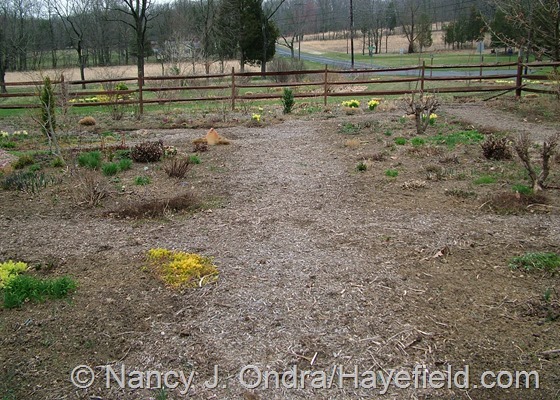 Looking toward the green star, I get half of the Diagonal Path and some of the house and foundation plantings. 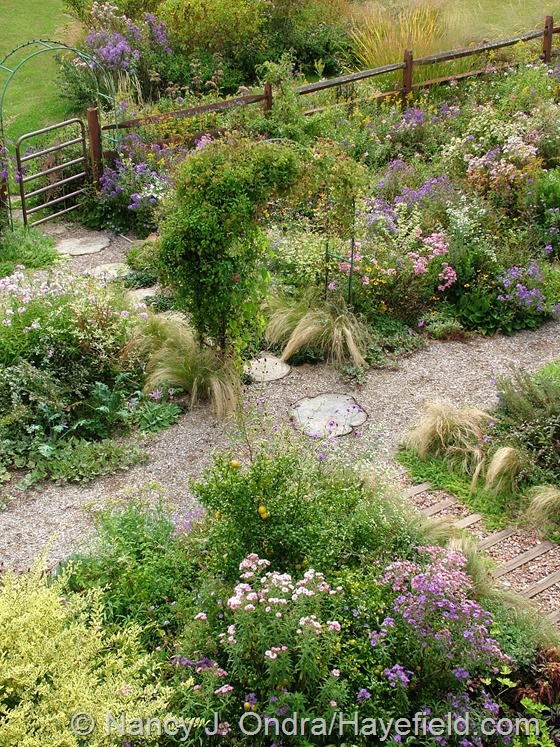 Turning 90 degrees to the left, I’m right at the end of the middle path in the front garden. Another 90-degree turn (looking toward the blue-starred point) shows the other end of the Diagonal Path. 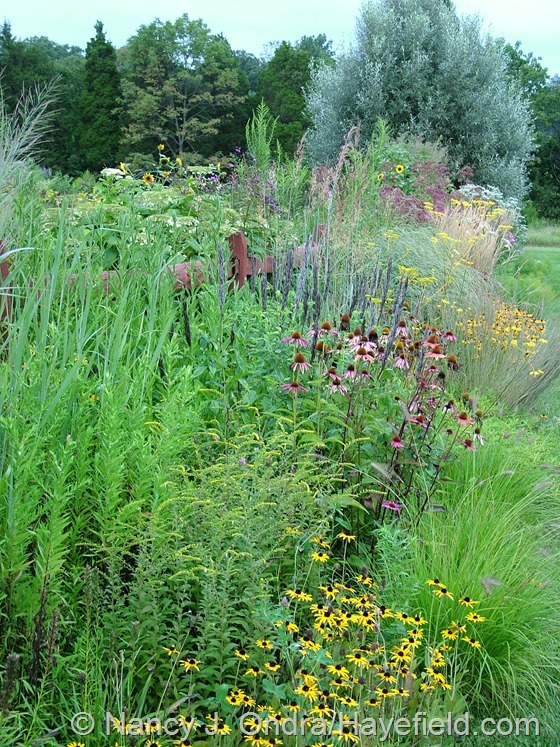 And one more 90-degree turn to the left gives me a wide view of the side garden. Choosing a few set points for taking pictures and using them each time you head out with your camera gives you the opportunity to compare similar views and observe the progress of your plants and garden from from week to week, month to month, season to season, or year to year. 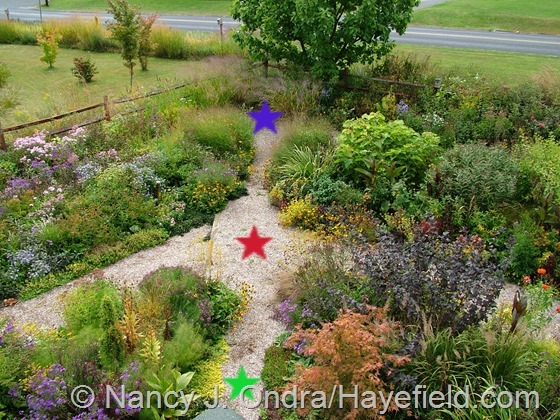 For example, here’s a series I took looking down the middle path in the front garden toward the red-starred point from the earlier aerial photo. It goes from February through late September of 2013. Set points don’t have to be at the junction or end of a path, of course; they can be anywhere you want, as long as you’ll remember to stand at the same spot. Some sort of stepping stone can be a useful location marker for a set point. 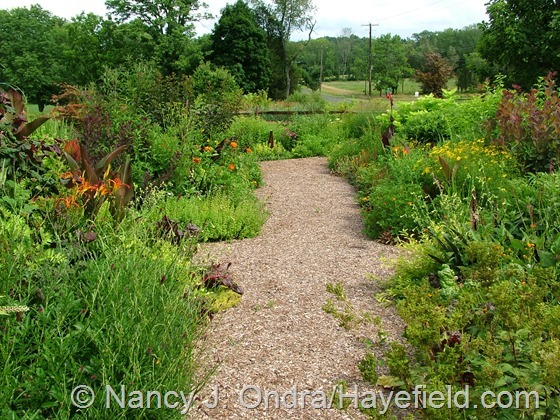 When I added the log path in the side garden, for instance, I found that the two end rounds make handy reminders for exactly where to stand when I want to take pictures in the side garden. It’s also helpful to have something constant to shoot toward. An ornament or bench can work, as long as it’s something you’ll leave in the same place over a period of time. In the courtyard, for example, I had a watering can sitting on a post, just for decoration, for several years. I changed the can a few times, but the post stayed in the same spot, giving a fixed point for comparing shots taken several years apart (late May 2007 and mid-August 2012). I tend to move my red glass gazing ball around a bit from year to year, but it usually stays in one spot through each growing season, so it works pretty well as a comparison point from month to month in any given year (this was 2012—late June and early September). 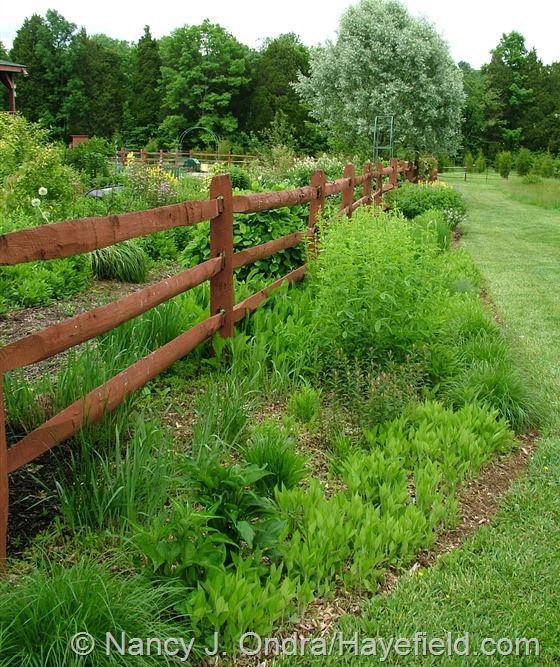 Arbors and trellises can be useful markers too, since they’re relatively permanent. This simple arch is a common feature in my side-garden pictures (the first three are from early August, late August, and late September of 2012 and the last three are from early August, mid-September, and early November of 2013). 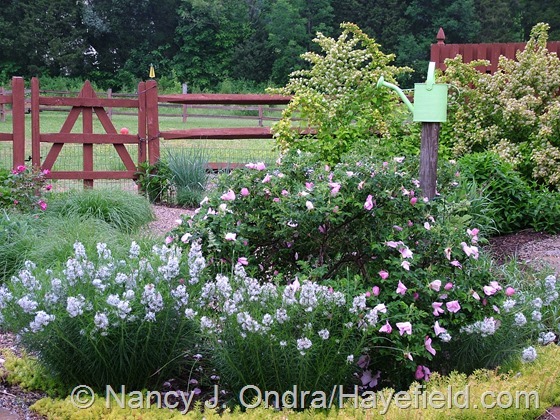 Mom built this wooden arbor for me as an entrance for the veg garden area, but it serves another use too, as a set point for photos I shoot across the side garden toward the back (these are from May 2012, June 2013, and October 2013). Granted, without a tripod and an eidetic memory, it’s hard to capture exactly the same view every time, but if you’re pretty consistent with how you shoot, a little cropping may be all you need to get a series of nearly identical views. These sorts of progressions are interesting to create just for fun, but they have some practical uses, too: letting you easily see where you need to make design changes, for one. When I look at the series from the front garden middle path, for instance, it reminds me that I’d like to find a really interesting focal point for the end of that path. A progression of one view taken every few weeks through one year also makes it obvious where seasonal interest is lacking. 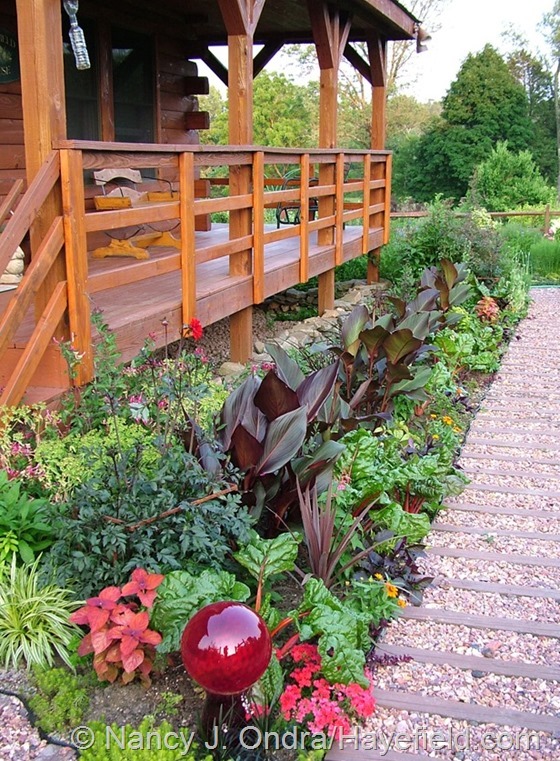 You can see when and where something is missing or not working, and then tweak your plantings or add an ornament to fix the problem. 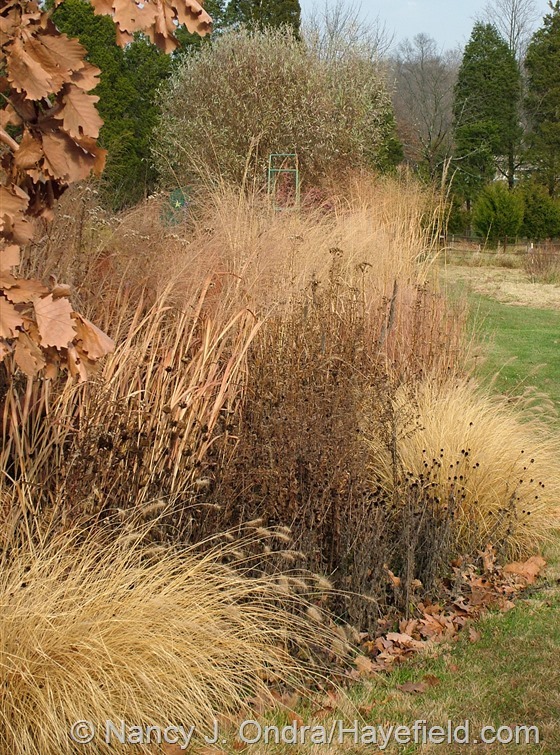 Comparing the same views over time is also a fantastic way to get a feel for how your plants grow and change through the seasons, and how they interact with each other in a border. Next topic: changing places. But before I sign off on this one, I’d like to know what you think about something: When I present two or more shots to make a point, are you ok with scrolling up and down to compare them, or would you rather see them combined into a short video clip? 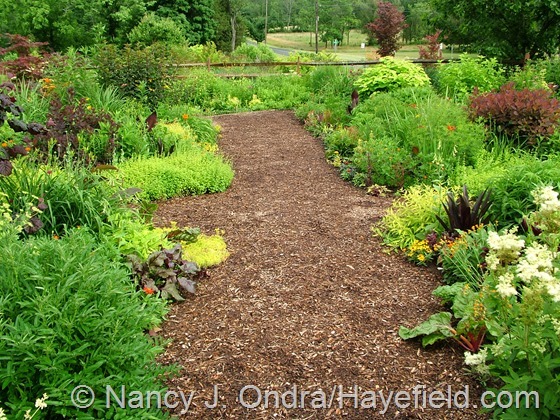 It would look something like this—Front Garden Middle Path on Flickr—but, if I can manage it, embedded directly into the post so you don’t have to click over to another site. Or, I could combine them into a single image, so you could at least see them all on one screen, though they’d have to be smaller to fit. I did try creating an animated GIF, but the image quality at any decent size is awful and the flickering is excruciating, so I’ve pretty much given up on that option. Anyway, if you have an opinion one way or another, or a different suggestion, I’d appreciate your input. I don’t mind scrolling up and down. I did not like the video because I could not go back and forth to savor the details. But if you do make videos it would be a more natural transition to have the pictires fade into each other instead of swiping. Thanks for sharing your thoughts, Rose. I have a lot to learn about the video thing if I decide to try that again. 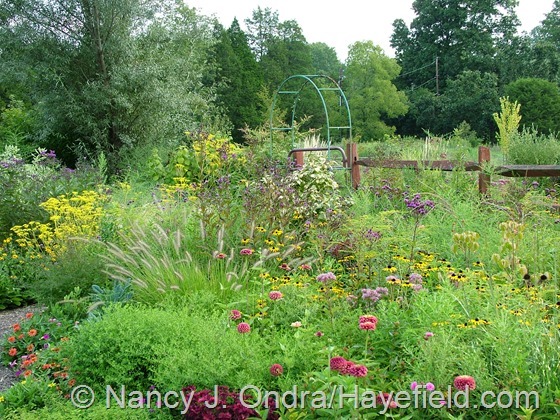 Thank you Nancy, great blog! And I am ok with scrolling up and down, I like to see the individual photos. Hi there, Donny. I can see where that sort of transition might work too. I’ll have to figure out what I can manage with the software I have available. 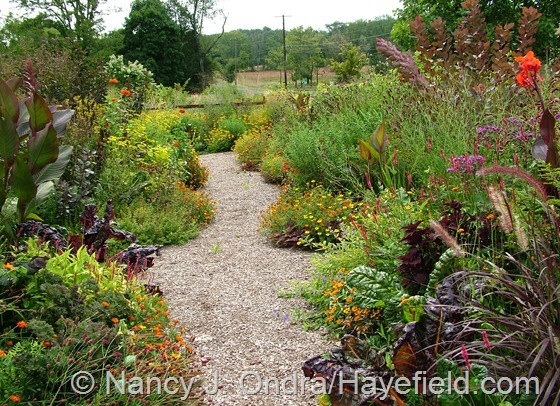 The pictures of your garden absolutely made my heart go pitty patter during this cold dreary winter day. Thank you so much for taking the time to put this together. I will look forward to seeing/reading more. Good to hear from you, Lisa! I hope you’re holding up all right through this rough winter. We’re gaining over a minute of daylight a day now, so spring is on the way! Always love your ideas Nan, Will be looking for my photo spots now! I found your old post on your tagging instructions yesterday and am now tagging all my photos, good thing its only 2 years worth. I had never done it before and have a hard time finding photos I need, wonder why!! I couldn’t get the video to play for me and the scrolling was so easy anyway. Loved the bottom winter scene with the sun shining on everything. Of course I could live in any of your photos! Isn’t it wild how a garden goes from bare ground to growth over our heads in a matter of weeks. Blows me away! Sorry that the video link didn’t work for you, Sue; I’m glad you let me know. It would be sad to put a lot of time into a clip and then have people not be able to view it. Have fun tagging your garden pictures. It’s a great winter project! My vote would be ‘no’ on the video images. I like to spend time letting my eye move around the images…with the pictures moving one may feel they need to hurry. 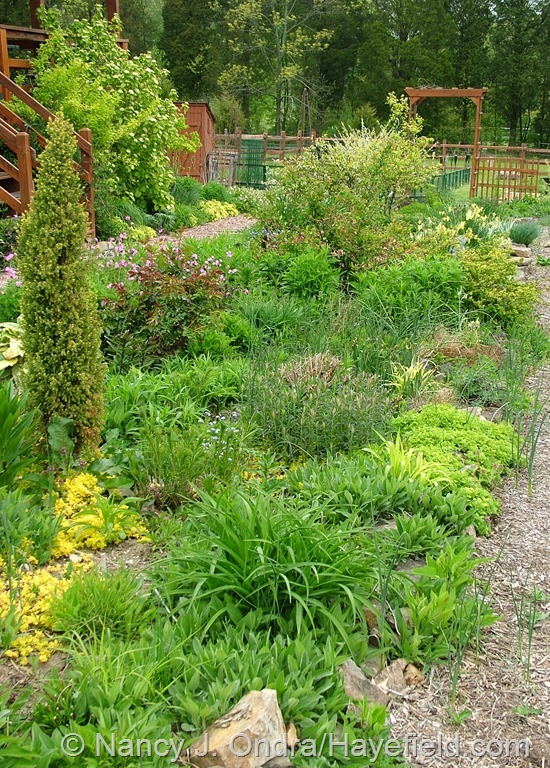 Time spent ‘in’ your garden is very peaceful and there is no need to rush. Thanks for sharing your thoughts, Mary. I think I prefer the separate images too. I am from Brazil and I am a great fan of your books and blog. Next year(2015) I plan to visit US. 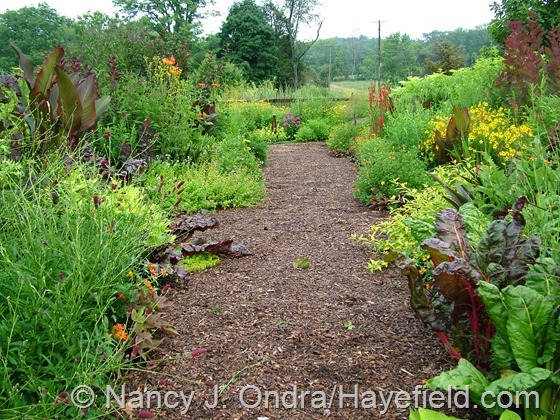 Is it possible to visit your garden? Hello, Jorge. It’s kind of hard to say now how things will work out for next year, but maybe we can see if it would work out closer to the time. I love your progressive photos. The video didn’t do it for me because there wasn’t enough time to take in each shot. I know you’ve mentioned it before, but how in the world do you keep track of what must be thousands of photos? Do you actually tag each one???? What program or app do you use to store them? Thanks for your vote, Lorraine. I tried playing around with the duration of each image but couldn’t seem to find a good compromise. As far as keeping track of the images, yes, I do have them all tagged. (As Sue mentioned earlier, I did a post about that a while back: Putting Words to Pictures.) They’re all on my hard drive, and backed up on SkyDrive too. To find them, I usually just click on Windows Libraries, then Pictures, then search for keywords or go into individual folders by date. It’s a simple system, but it works for me. 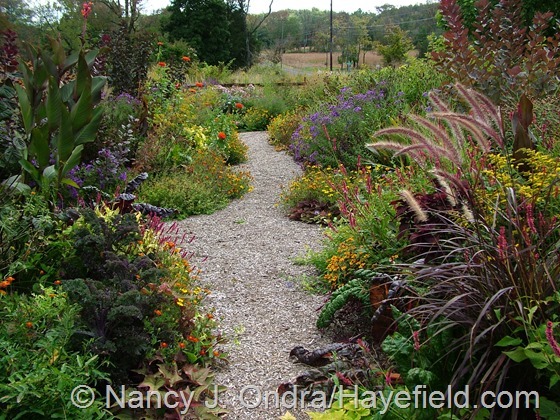 I love to see how your paths change through the seasons,and even through the years. You always have something interesting going on. I also would rather scroll than have video. I never click on ANY videos online, they seem a waste of time. 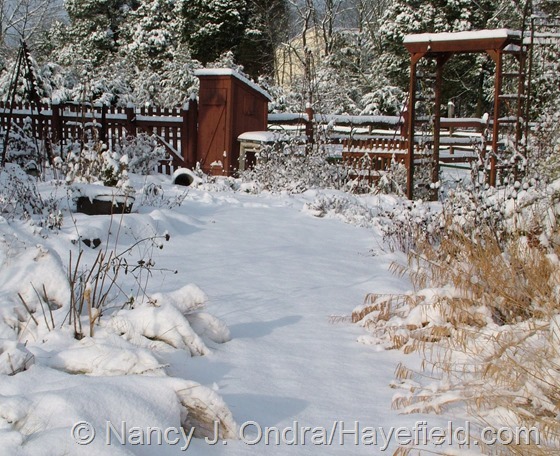 your garden photos are a breath of spring in this cold winter! Good to know your thoughts about the video option, Brenda. There seems to be an anti-video consensus so far, which is lucky for me because I don’t have much skill in that department, though I’d have been willing to try to learn more. Hope you’re keeping warm! Beautiful! 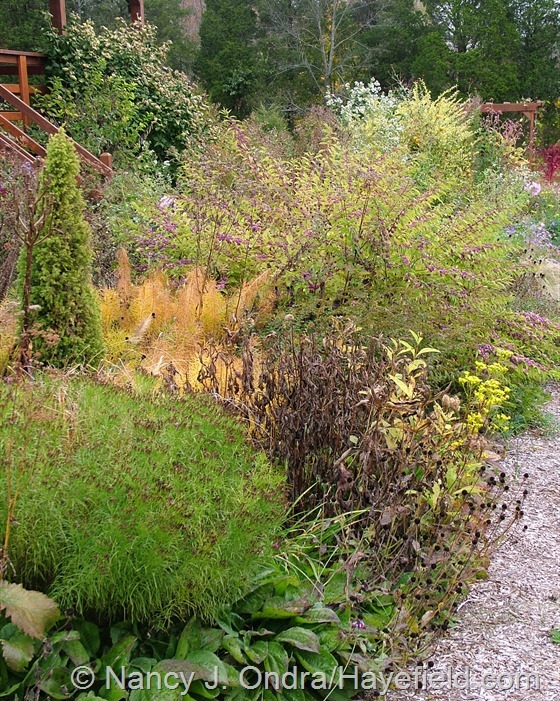 Love how you see your garden spaces transform throughout the seasons just with scrolling down! Good morning, Flora! Thanks for stopping by today. I’m glad you enjoyed seeing the transformations. Finding and compiling the images has been a good way to cope with the bitter cold and snowy weather we’ve been dealing with for the past month! Hey there, Kris! You’re right: slideshow is a more appropriate term than video. What I might do is stick with separate images but also include a link to a slideshow if I think it might be of interest; that would suit everyone, then. I do not mind scrolling up and down. For me, the photos are a better visual than the video. 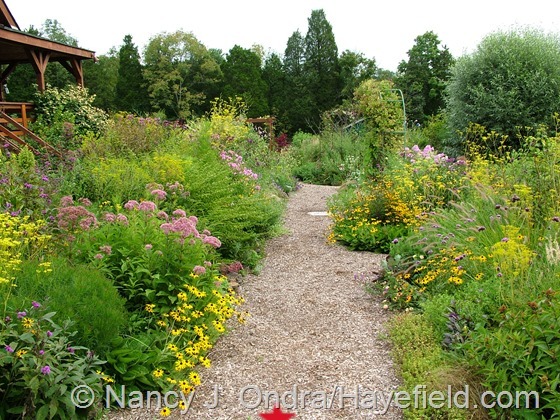 I loved seeing the progression of your garden throughout the seasons! I appreciate your input, Mariann. I do wish I could find a way to upload the images at a higher resolution without having to buy more storage space from WordPress; I’m running out of room as it is. But it’s a bit disappointing to see them be kind of fuzzy when the originals are so much sharper. 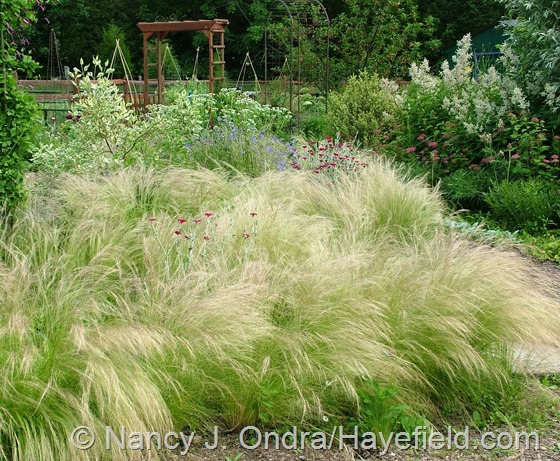 Good post, it’s inspired me to do some of the same in the next growing year. You’re right, it will help to see what’s missing. I don’t mind scrolling, and like the idea of a combination frame of all shots together also. Thank you! Ah, a tentative vote for combining the images; good! I may try that too next time. Thanks for speaking up, Donna! Helpful as always–don’t mind the scrolling a bit. 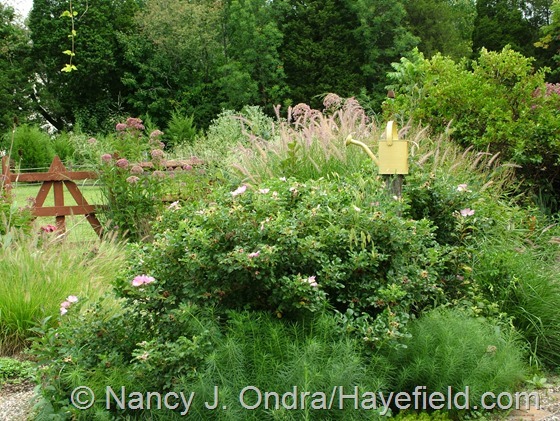 Nan, I applaud your work– so refreshing to see a garden at its zenith and nadir. Good to know, Julie. Thanks for the vote–and for visiting today! I agree with what Rose said about fade instead of scroll. And I think the slides changed a little too quickly for me. I don’t have any problem with scrolling up and down to see pictures, however. My biggest lack is enough time to study them and absorb the lessons. What a video would be really good for is as a teaser for a forthcoming book. Oh, that’s an intriguing idea, Kathy. It would have been a good complement to Tried and True Perennials, perhaps; not for the next two titles, unfortunately, but maybe I’ll find the time to do another relevant self-published one in the next year or two. If I try the slideshow again, I’ll go with a slightly longer duration for each image. 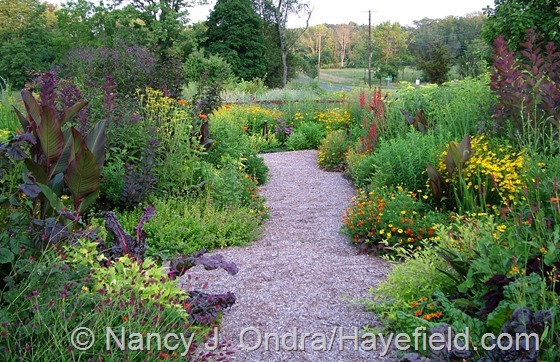 Your garden is such an inspiration to me. I remember (from one of your books) when it was just being planted. 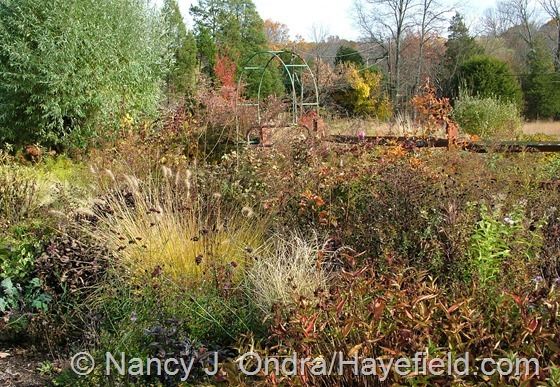 My garden is now 2 years old and I can’t wait for Spring to see if three years is the charm! Thank you. I am so happy to have found your blog. You’ll be in for a treat this year, Jill: the third year does seem to make a big difference. I can imagine that you’re dying to see how it turns out! I’m so glad you stopped by today and look forward to having you as a regular reader. Thanks, Christine–I love it too! Wow! and Thanks! I don’t mind moving my mouse, hand, or whatever at my own pace. That’s one problem with video – can’t make it at my pace. It’s like reading, sometimes skimming, sometimes savoring each and every word. Depends on reader’s mood and available time at that particular moment. Wonder about the resolution too of a video? But, hey, go for it. It might be the future of visual sharing – seeing a butterfly on the wing rather than caught in frozen flight. Best to you in the new year. Good morning, Shenandoah! Thanks for chiming in. That’s a good point about being able to go at your own pace. I got impatient watching the video/slideshow, waiting for the next image to come up, but I see others thought it went too fast. 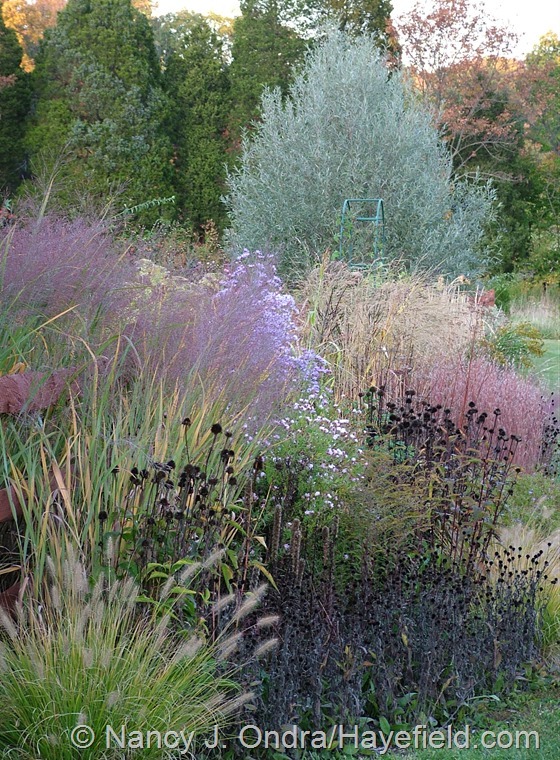 Good wishes to you too for a glorious growing season in 2014. Great idea for a post, Nan! I generally do the same thing for each bloom day post. 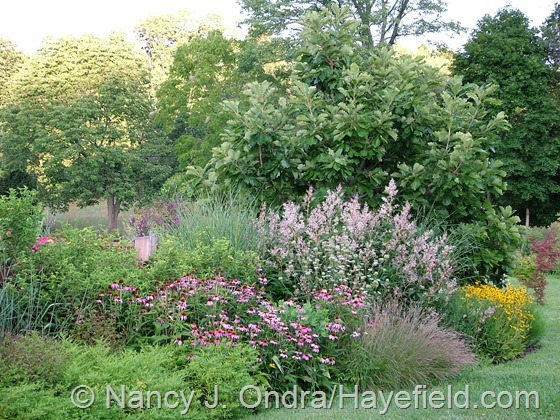 I try to always take a few wide shots of the entire garden (easy in my case…it’s so small) from the same several vantage points each month. 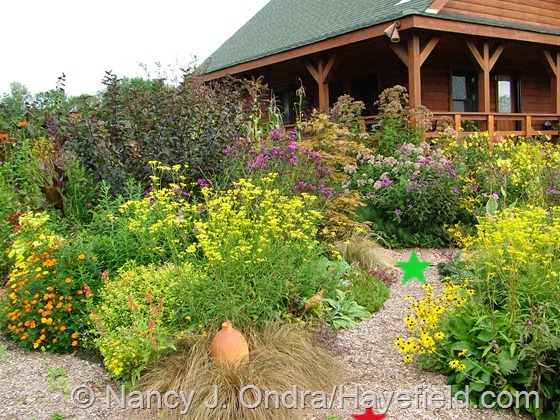 It’s fun to see everything put in context…and it gives me a great way to look at how the garden progresses throughout the year. I will pretty much always vote in favor of the biggest photos possible. Perhaps, if you have time, you could have a video at the end of the post itself, just cycling through all the photos as a sort of recap? Can’t wait for the next part! That’s a super idea, Scott! And hey, wouldn’t a slideshow of the highlights from your previous season’s Bloom Day posts be a neat way to mark the event in December or January? I’m OK with scrolling. Photo gallery viewers (like blogger) are also very practical to view images. I’m sure WordPress has a plugin for that. As usual, great post! Hmmm…yes, WordPress does have a gallery function. I tried it out when it was added years ago but wasn’t thrilled with it; can’t remember why, though. I’ll look into it again and see if it might work. Thanks for the tip, Miss M! Scrolling works for me. Photos quite a lift! Thanks, Nan. I appreciate your vote, Bruce; many thanks! I’m looking at 3 feet of snow outside, so your email was a true delight today. Poor Sandy! I’m glad I could brighten your day a bit, anyway. I like to study your images and scrolling back and forth between images is better for that, although the video images do emphasize the drama of the change from one period to another. 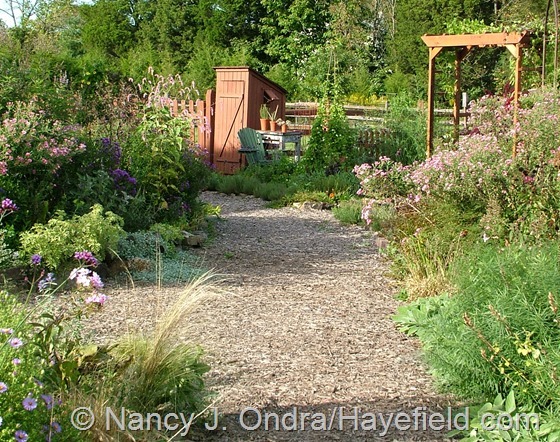 Seeing how your garden changes from one season and one year to the next is always inspirational! Thanks for lovely comment, Kris, and for sharing your thoughts about the images. Being able to scroll back and forth to compare views is kind of like doing those picture puzzles where you have to find as many differences as you can between to similar-looking images. Hi Nan, Wonderful photos of your beautiful garden. I nearly always see something I would like in my own garden, though this time it is a gazing ball. 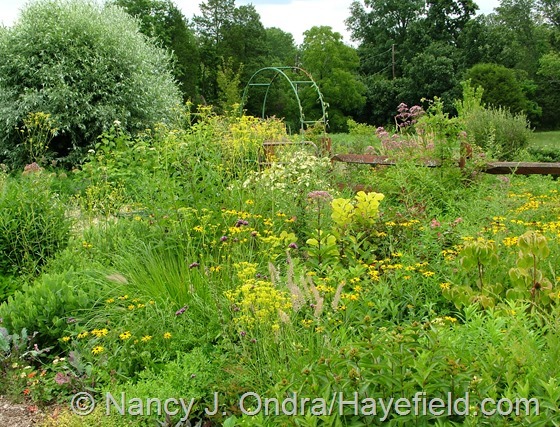 I am redesigning a new area of my garden after having a pond installed so that gives me something to do over the next couple of months. I prefer to scroll the photos rather than watch the video, thanks for giving us both. Oh, goodness–I’ve corrupted you now, Allan. I’m not sure how folks feel about gazing balls where you are, but around here, a gazing ball is pretty much the lowest class of garden ornament: about on par with plastic pink flamingos. I don’t mind being tacky, but it’s not a decision you want to make lightly. In my defense, what I have isn’t technically a true gazing ball; it’s just a red glass globe sitting on top of a red glass vase for a bit of height. 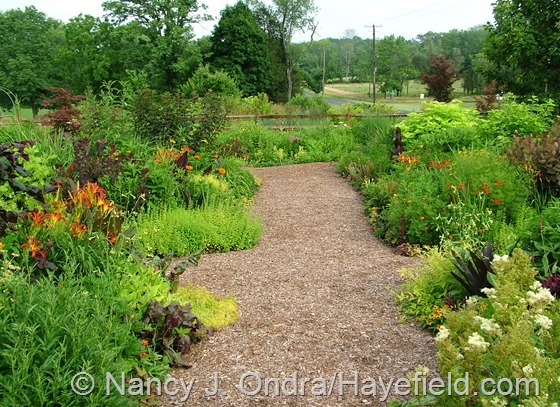 Anyway, I wish you many wonderful hours planning and planting your new space! Inspiring just one person makes this all worthwhile for me, Kimberly, so thank you for saying that. It’s a kind of repayment for the books and photos that have inspired me over the years. 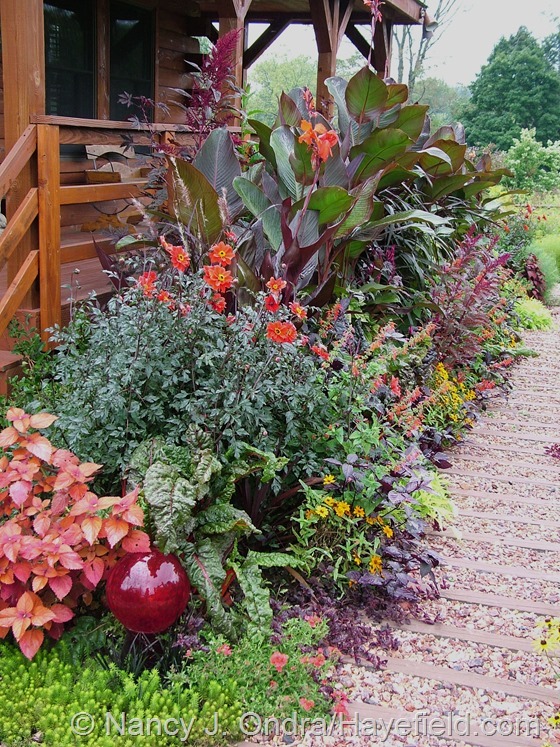 I love your phrase “flat to fabulous.” I realize that my approach to gardening here doesn’t appeal to everyone–especially people that like lawn, lots of hardscaping, and evergreens and such for winter interest–but as long as we’re each gardening to please ourselves, that’s all that matters, right? 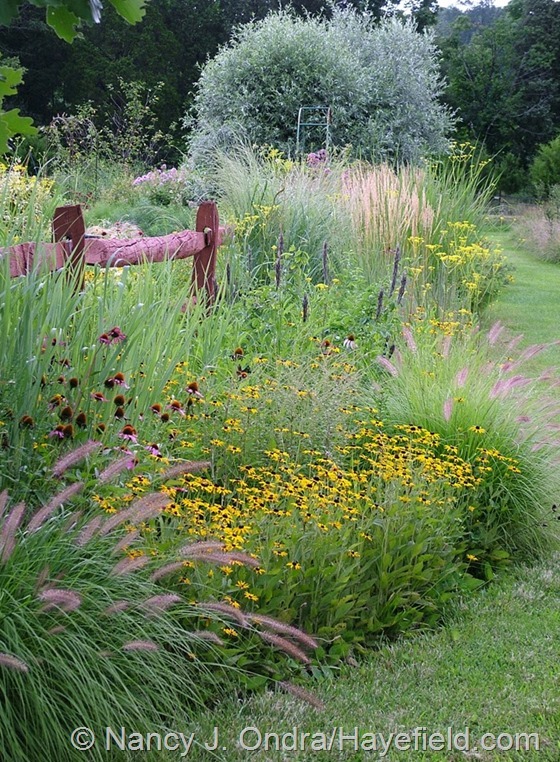 I wish you all the best in creating your own dream garden! Wow, Kimberly – that’s so insightful: I hadn’t organized my own thoughts about that garden that way, but you really summed them up neatly. 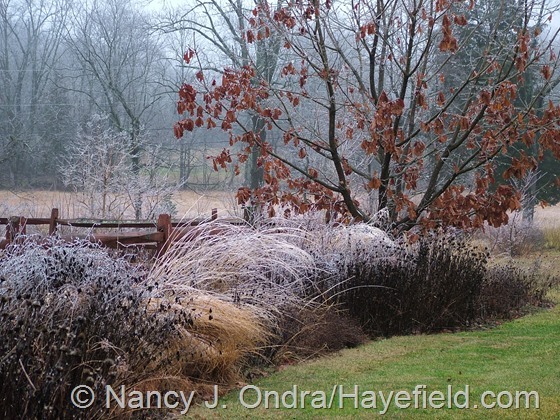 While I completely understand why evergreens and other aspects of “winter interest” are valuable, it’s very peaceful to have a few months of mental rest from the needs of the plants and the garden. 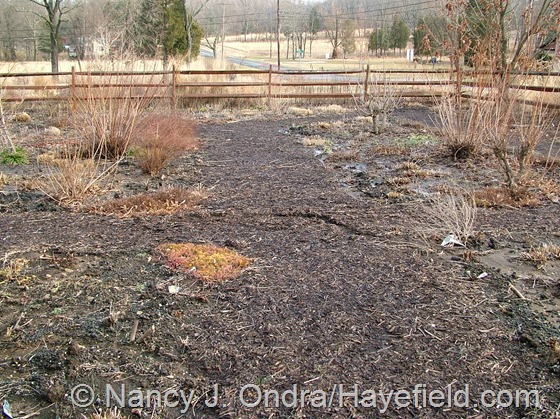 I didn’t get around to cutting everything down before the snow came this year, and I find that I miss the blank slate: as you said, I’m mentally planting and transplanting because I can still see the remains of last year. And yes, I am continually awed at how things can go from empty to overflowing in just a few months! I don’t mind going back and forth at all, in fact I enjoyed it! Looking for little sprouts that turned into big cannas and tufts that turned into big haystacks of grass was cool, it’s amazing how much things grow in one season. I’m not much of a video fan btw, so my opinion is completely biased. 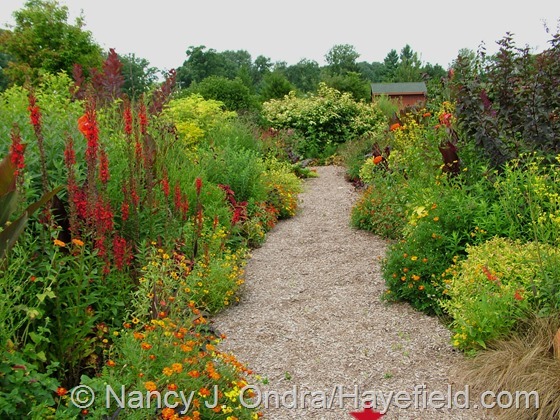 The cardinal flower clump with all the marigolds and yellow foliage is amazing. I’m going to secretly copy the idea this spring and see if it comes anywhere close to yours! I hope you can come up with plenty of other excuses for posting more pretty garden pictures, they’re the perfect tonic at this time of year! Hi Frank! 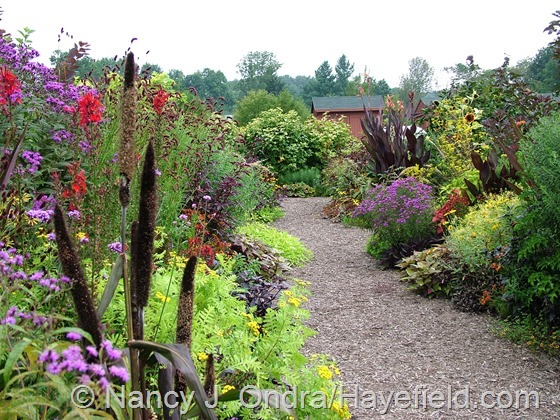 It took a few years for the cardinal flower to seed around enough to make a nice show, but it was worth the wait. I wish you great luck with your own red-orange-yellow combo. And yes, I have enough excuses for a half-dozen more posts, I think, so I’m glad you thought this one was ok.
Great post, interesting as always and the video worked for me. I agree with most – still photos are better than video for your blog. 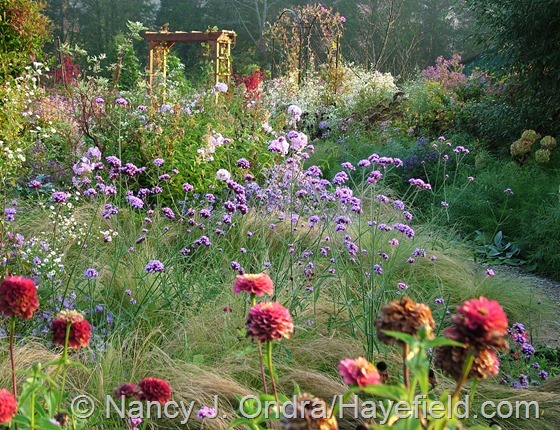 “We” would rather linger over your garden images rather than be rushed. Sometimes just because ‘we can’ doesn’t mean ‘we must.’ And, about that “eidetic memory,” definitely a $0.50 word. “Plastic pink flamingos,” at least that was thesaurus free. Thanks for the link to the Etsy site. And thank you for providing some winter relief. I value your feedback, John; thank you. I’m glad that the slideshow idea wasn’t very popular, because it seems that WordPress doesn’t want to let me buy a video upgrade after all. Maybe I can put that money into a space upgrade instead for more and higher-resolution images. Still photos are the way to go! 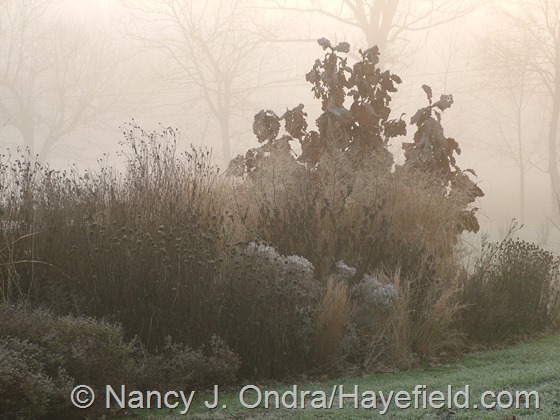 If I had to pick a favorite image–and thank goodness I don’t–it would be the one in the deep fall fog. I was skimming the blog, but that one made me stop. Perhaps it was because the lighting differs so much from the others. It creates a mood that is–I’m not sure what the right word is–mysterious? Mmmmm…that’s one of my favorites too, Erin. I had to sneak it into that series even though it was several years earlier than the one before and after it. I’ve never seen the light quite like that since that day. Wow!!!!! Thanks for the shot in the arm, Nan. I was just looking through my own photos the other day and marveling over the phenomenon of summer and its generosity and fulsomeness. Thank you so much for your diligence in putting together this post. It must have taken oodles of work and thought and it sounds like I am not the only one who will benefit from this. I have often taken shots from similar points to similar views but have never formalized the process. Fantastic idea to develop photo set points. Keep on keeping on. 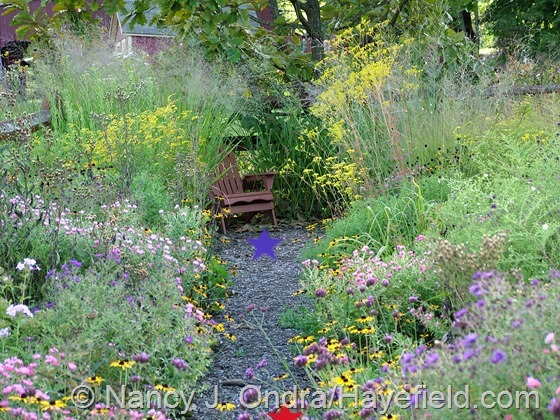 The manifestation and recording of your garden visions and dreams are needed in this low maintenance world. Oh, and I vote for the photos, too. Thanks for the vote, Barbara, and for the pep talk. 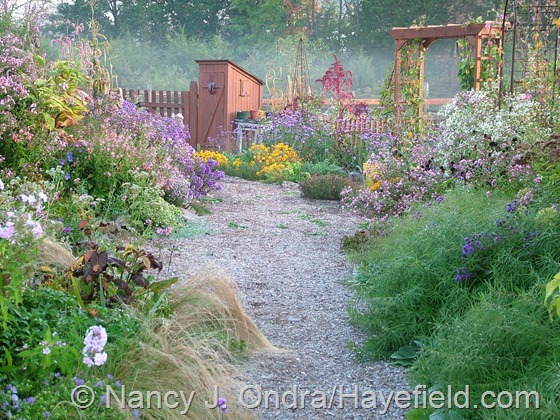 I think the neatest thing about compiling series of images like these is that it’s something a home gardener can easily do and most professional photographers can’t, unless they have a garden of their own to shoot or live close to one that they can visit frequently. And then, they’d need a reason to go to the effort. There’s not much demand, though; books and magazines rarely show progressions like these. So, score one for backyard photographers! Me too, Luke. Winter can’t get much more dismal than this drippy, dreary January day here in PA. I hope you’re at least getting some sunshine today! While a loved the video clip for the pleasure of “sliding” through the season (sort of like going down memory lane! ), for real study the still shots are a better option. 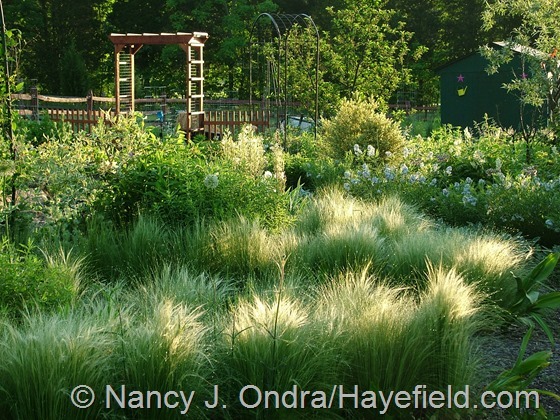 But your experimenting is endlessly fascinating–both in the garden and on your blog. 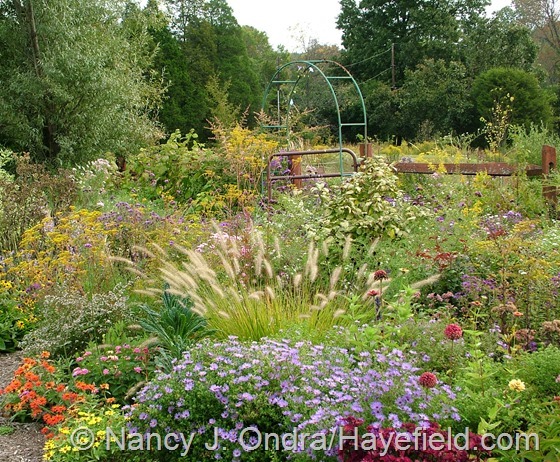 For me it was all so timely since I had just decided that for the first time I was going to try and maintain a photo journal of my garden through the year. Rainy and drippy, yes, and itching to get out and dig, but there are still treasures lurking. My hellebores are peaking out, one of my witch hazels is in full and fragrant bloom (Rochester) and critters are sneaking around when I’m not looking nibbling here and there. So there’s life out there! Only 8 more weeks…. Maybe you’ll join us as a garden blogger, Nora? I’ve found it to be the only form of journaling that I’ve kept up with for more than a few weeks. Bloom Day, in particular, is a great incentive to get out and take lots of pictures every few weeks. Sounds like you could be starting any time now. Nothing new is stirring here yet, but soon, perhaps–if we don’t get another “polar vortex” event, anyway. the fence in one shot really worth the investment? Thanks. I can’t tell you how much I appreciate your comment, Bob. It’s getting increasingly more challenging to find topics that I think might be of interest and then get up the nerve to hit “Publish” on a new post. Hearing that someone finds them of value provides an incentive to keep trying. Even more, I value suggestions of things I could change or improve. I too like plant ID information on photos and normally do add it to mine, but I got a bit frazzled trying to finish this one and skimped on that final step. Now that I know that at least one person noticed, I will definitely make the effort on the next one! In regard to the manual (a.k.a. kick-type) sod cutter, yes, it was worth every penny (about $100 when I bought it 13 years ago). 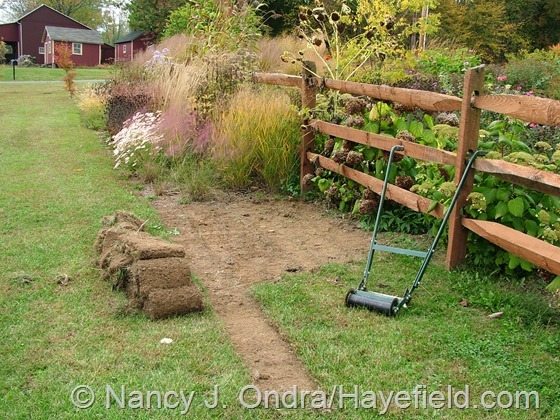 I sometimes wish that I had invested in a power sod cutter instead, but I couldn’t afford one, and I probably would have ended up making way more beds that I could handle at one time. With the manual sod cutter, the amount of effort it takes to use pretty much limits me to a reasonably sized new planting area. 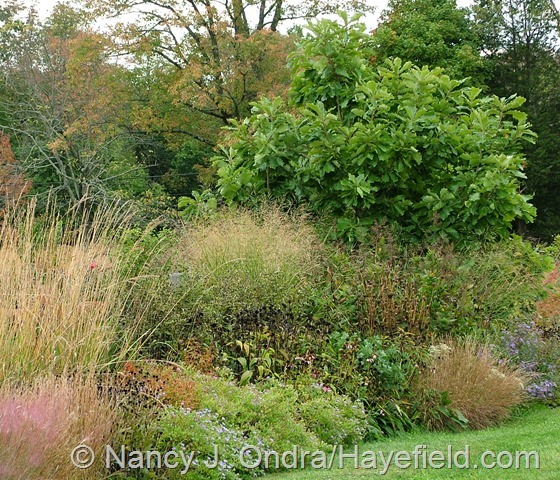 (As you can see in that shot, I did that border in two stages: one in spring and the rest that fall.) Someone else sent me an email asking if the tool is still available. The one I have doesn’t seem to be, but there’s a newer one that’s getting good reviews on Amazon, if anyone else is interested: Quail Manual Kick-Type Sod Cutter/Edger. Granted, it’s about $300, but even at that price, I would say it was worth the investment for anyone who planned to create lots of new beds over a period of years. 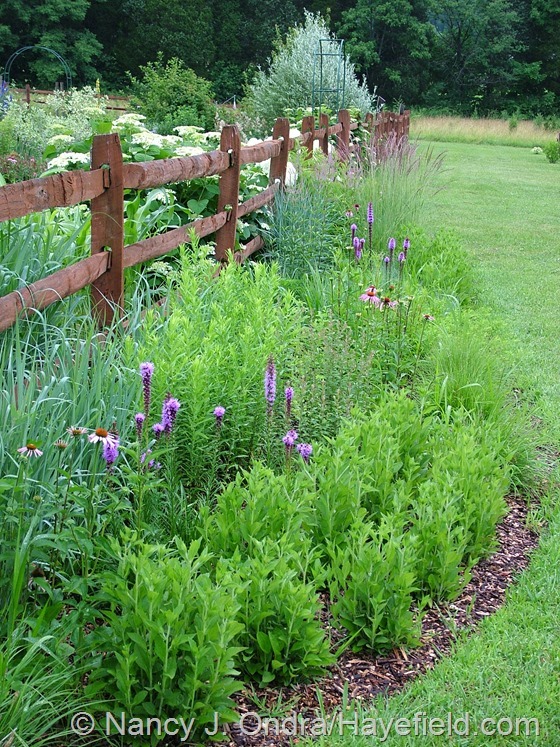 Your garden has inspired many of my redesigns. 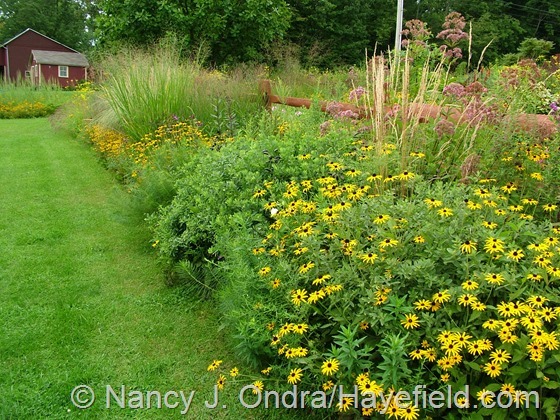 I have lots of photos of my garden but none show the progression from one spot. I think I’ll give that a try this year. That’s great to hear, Casa. 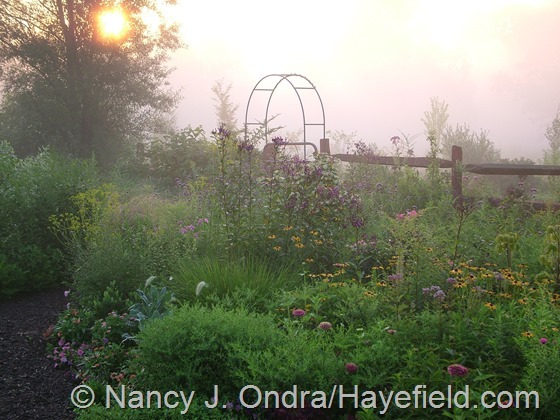 I wish you a wonderful gardening season with lots of terrific photo opportunities in 2014! 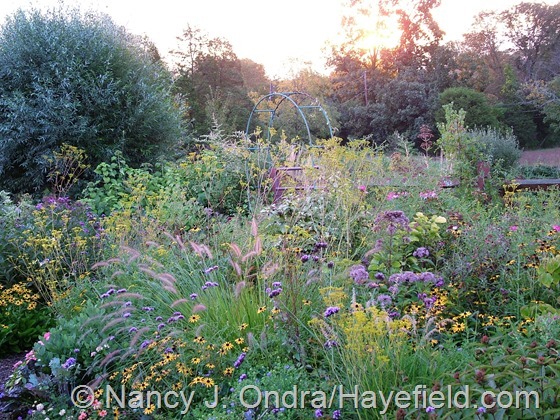 Oh my golly your gardens are so incredibly beautiful – in every season!! 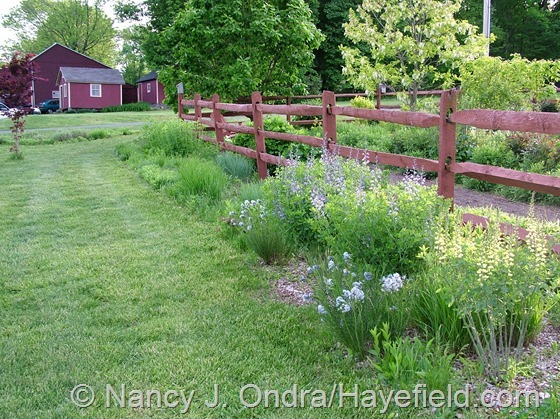 Question: I noticed in the picture where you were extending the garden along the fence line – it looks like a hand sod cutter – how difficult was it to use? I need to remove quite a bit of sod and am trying to figure out how best to do it. Thanks, Gayle! The manual sod cutter does take a fair bit of energy to use. Getting the conditions right–moist soil, as a day or so after a good rain–makes a big difference: if the soil is soggy or on the dry side, it can be significantly more difficult. Lots of surface rocks also complicate the matter. If you really do have a lot of sod to clear at one time (over a period of a day, or a few days), you’re probably better off renting a powered sod cutter. But if you can do it over a period of a week (or months or years), investing in a manual cutter could be worthwhile for you. And, it’s really good exercise! I put a link to one in the comment just before yours.